a central launching point to access all of our great features. A special Family View allows parents to follow their children's progress. Chess Club Panes link you with each Chess Club you belong to. The Pane displays any Alerts from the Coach. Clicking the Pane opens it to reveal up-to-date information about the club. * How do we know who belongs to your family? We only group members into families if they have initially registered using an email address that matches one of our existing members. This is especially handy for younger children who do not have their own email account, and are often registered by parents under a parental email address. Each child still gets their own unique User ID and Password to access their personal Home Page, and everyone's Home Page displays a pane for each family member. But while Home Pages only reveal details for that logged on user, the Family Page lets parents view detailed information for every family member. 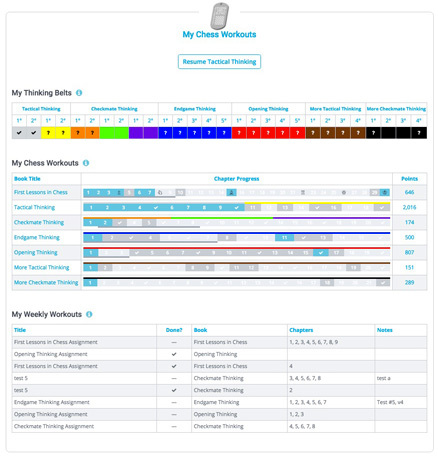 So parents can keep track of each child's thinking progress! 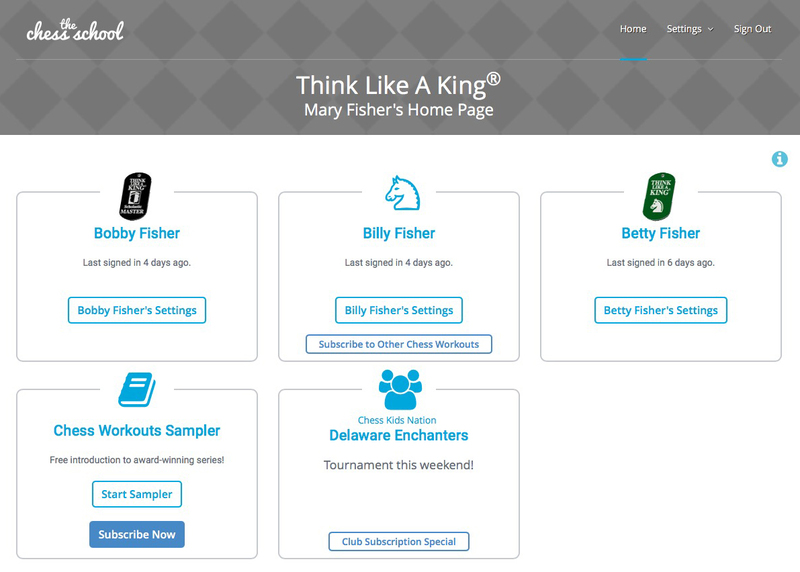 When parents log on their Home Page actually functions as a Family Page that gives them the details of each child's chess activity, and allows them to keep track of exactly how all their kids are doing in the program. You can see exactly how much learning effort your kids are putting forth, how much progress they are making, and even stay up to date on any Weekly Workout Exercises their coach may have assigned, including monitoring when they are due and when (or if!) they were completed.